Recreational boating has a very old history in Charlottetown. According to Harry Holman's website, the Hillsboro Boating Club ran the "Regatta" in Charlottetown as early as 1874. Founded in 1922, The Charlottetown Yacht Club is located on one of the most scenic points of the Charlottetown waterfront, with a panoramic view of the Harbour. 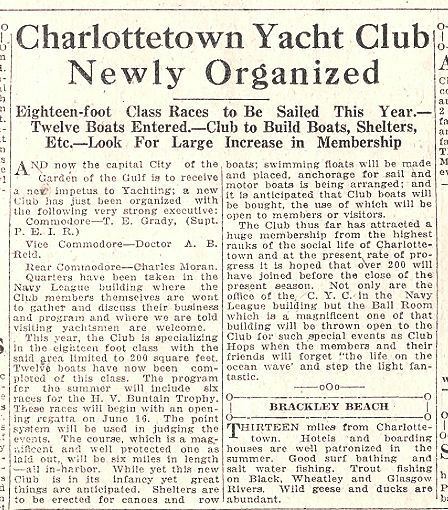 The CYC was established to "Promote small boat sailing and motorboating in and about the Charlottetown Harbour, and to provide for anchorage and facilities relative thereof for all Club boats as well as visiting boats and yachts". The origin of the Club is documented in the reproduction of an article from the Halifax Sunday Leader published in June 1923, shown below. 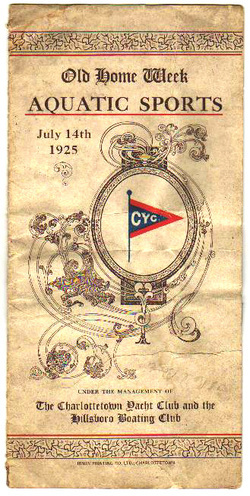 The first CYC clubhouse was built in 1937. On his website, Harry Holman told the story of why and how the first CYC clubhouse was built on the site in 1937. Visit http://sailstrait.wordpress.com/2014/11/11/cyc-1937-clubhouse-was-modern-in-every-respect/ to see the pictures and read the early history. The year 1964 was another milestone when major renovations were made to the wharves and the building was extended: https://sailstrait.wordpress.com/2016/07/19/1964-a-banner-year-in-the-charlottetown-yacht-club-history/sailstrait.wordpress.com/2016/07/19/1964-a-banner-year-in-the-charlottetown-yacht-club-history/. The CYC has become a leader in seamanship education. With a strong Junior Sailing Program using Laser, Optimist and a 420 fleet, many young people have enjoyed becoming water-wise. Also, the "young at Heart" are learning to sail in our adult sailing courses, which are rapidly gaining popularity. CYC has held up the long tradition of education, racing, and generous hospitality established by Charlottetown boaters in the 19th century. In 1993-94 CYC took a giant step forward by building a new clubhouse and marina. 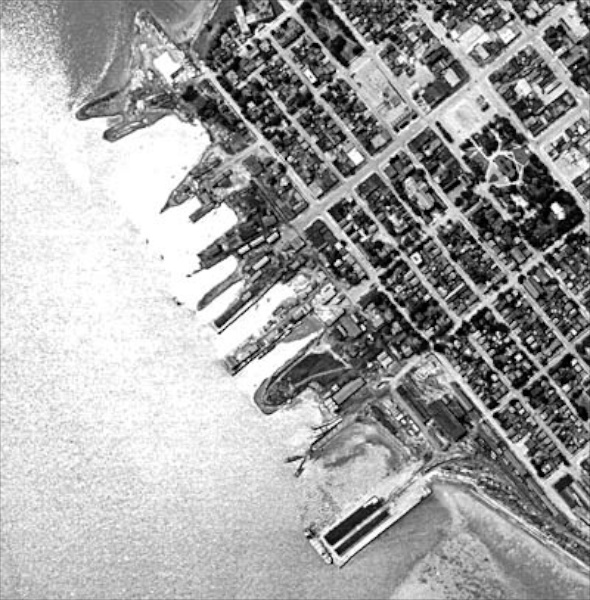 In 2000, CYC installed a new state of the art floating breakwater and 80 new marina slips. The docks were renovated in 2002 to increase the number of slips and install new electrical pedestals with meters, dock lighting, cable television and telephone outlet capability. Today boaters have access to the marina, moorings with tender service, gas dock, launching slip, a 10,000 lb. crane and mast crane, all serviced by a friendly knowledgeable staff. Charlottetown Race Week in its present form dates back to the 1980s but has deep roots in the community. Charlottetown has hosted a Regatta in various forms since the 19th century. On his website, Harry Holman notes that Hillsboro Boating Club operated a popular Regatta at Charlottetown as far back as at least 1874, following the rules of the Royal Halifax Yacht Club. Like today, the 1874 Regatta attracted "fast boats from various towns and settlements on the coast". A grandstand was erected at Connolly's Wharf. During a week of festivities they held a public dance in the Drill Shed, a Grand Ball and a Concert. Over the years commercial fishermen and professionals have competed in various regattas at Charlottetown along with weekend sailors. 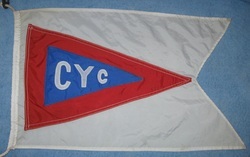 One of the earliest activities of the Charlottetown Yacht Club was the identification of a burgee for the club. 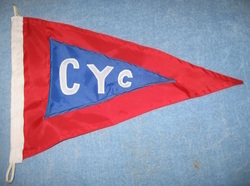 This triangular red and blue flag with the CYC letters in white comes from a long yachting tradition. The triangular flag is unique to yachts and should be flown to show that the owner is aboard or nearby. The colour and design identifies which club the yacht belongs to. Originally these flags were flown from the masthead but more recent practice it to fly the burgee under the starboard spreaders. If it has no other value it can act as a wind indicator. Powerboats fly the burgee off a short staff on the bow. Club commodores fly a special flag (because commodores are special) which has similar design elements but is square with a swallow tail. An interesting web site which features burgees from all over the world is www.burgees.com. Burgees should be an essential element for the annual sail-past.